ASRock is a company that manufactures motherboards for computers and home theater computers. They are based in Taiwan and are a company that was spun off of Asus who also used to make motherboards. It's currently owned by the Chinese Pegatron Corporation (Source). According to some forum experts, ASRock used to specialize in 'budget' boards, which earned them a somewhat negative reputation. However, they say that the current boards are pretty solid and on par quality-wise with bigger brands like Asus (Source). Your computer motherboard acts like a highway that allows all the information produced by the various chips and electronics to travel (Source). As stated, the computer motherboard is the piece of hardware that facilitates the transfer of information produced by your computer’s various processors and connections. Without a motherboard, your computer could not function (Source). Buyers say one of the most important things to look for when buying a motherboard is the type of processor socket it has. Most boards have one of five sockets so your choice of processor will determine what motherboard you get. Boards are typically designed to accommodate either Intel or AMD processors. Also, be aware of how big of a rig you’re building and whether you’re going to want expansion in the future. The motherboard’s size and expansion options are key for your computer’s longevity (Source). In this piece, we take a look at five budget ASRock motherboards, and by budget, we’re talking under $100, to consider if you’re planning on building a PC with AMD or Intel chips. ASRock Micro ATX DDR3 2400 — AMD CPU socket. DDR3 SDRAM sockets. Should have plenty of clearance if you decide to add an aftermarket cooler. 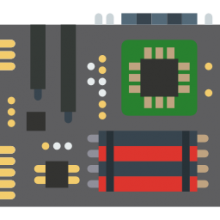 BIOS gives users a visual layout of the board and a detail of what’s plugged in. Buyers like the expandability and the ease of setup. 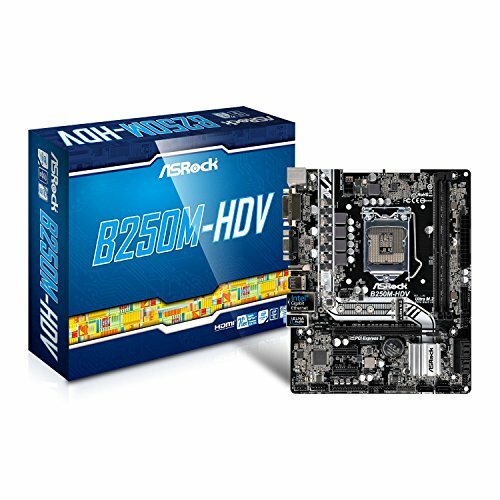 ASRock B250M-HDV LGA1151/Intel B250 — Will fit into a micro ATX case. Supports up to 6th generation Intel chips like Kaby Lake. Small board will be good for smaller designs. Highly rated board that delivers great performance for the price. 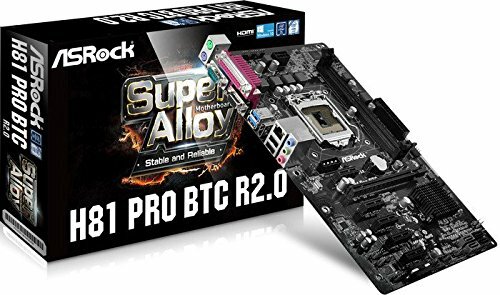 ASRock H81 PRO BTC R2.0 LGA 1150 Intel — Is the highest priced board we looked at. Supports up to Intel’s 4th generation chips and accepts DDR4 SDRAM modules for better performance. Also has two extra 4-pin connectors to give your graphics cards more power. Buyers say it’s a great board for mining bitcoins (Source). ASRock Micro ATX DD3 1066 — Like the previously mentioned ATX DD3 2400, this motherboard is designed for the AMD chipset and DD3 RAM. It’s a barebones board that provides a good mix of support for new and legacy hardware. No Bluetooth support, but it does have support for dual monitors. New, this board can be had for under $50, which is a good deal if you’re building a PC that’s not going to be pushed too hard. ASRock Micro ATX DDR4 LGA — This motherboard is designed for Intel’s chipset and unlike the other boards we looked at, this one accepts DDR4 DIMMs up to 32GB worth of RAM. Has Kaby Lake support right out of the box. Users say that, while overclocking is limited on this board, it’s still very fast right out of the box. If you are looking for an ASRock motherboard, you might want to consider the DDR4 LGA 1151 H110M-HDS model. Users like the performances of this motherboard, but do complain about the number of PCI sockets. This product is a Micro ATX motherboard with LGA 1151 socket and Intel H110 chipset. It has 1x PCI-Express 3.0 x16 Slot and 1x PCI-Express 2.0 x1 Slot. It features 2x DDR4-2133 DIMM slots, dual-channel, non-ECC, un-buffered memory with maximum capacity of 32GB. The audio characteristics are: Realtek ALC887 7.1-Channel High Definition Audio CODEC. This item might be a solid choice if you want a motherboard with 4x SATA3 ports. 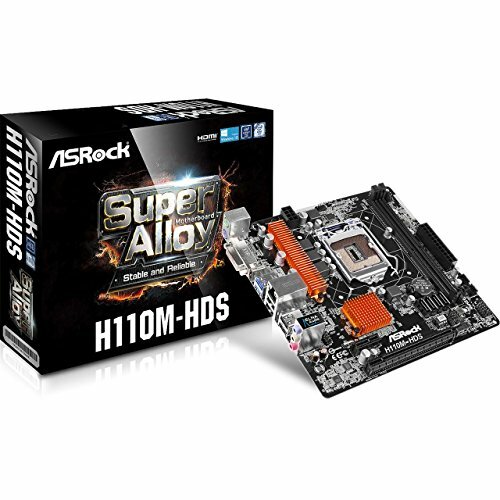 The general user consensus concerning the ASRock motherboard H110M-HDS is that it works well and that it is simple to install. They agree that it is perfect for the budget build. However, many buyers complain that it doesn’t have many PCI sockets. As they say, it only has one 1-4 pin CPU fan connector and one 1-3 pin rear fan connector. Therefore, if you need more fans you’ll need to buy an adapter. The ASRock motherboard DDR3 1066 FM2A68M-HD+ could be a solid option if you want a Micro ATX Socket FM2+ motherboard. Users like the versatility of this motherboard, but some do complain of receiving a defective item. This product is a motherboard with an AMD A68H (Bolton-D2H) chipset. The memory characteristics: 2x DDR3-2400+(OC)/2133(OC)/1866(OC)/1600/1333/1066 DIMM Slots, Dual Channel, Non-ECC, un-buffered, and a maximum capacity of 32GB. It features 1x PCI-Express 3.0 x16 slot, 1x PCI-Express 2.0 x1 slots, and 1x PCI slots. This item could be a solid choice if you’re looking for a DDR3 motherboard. 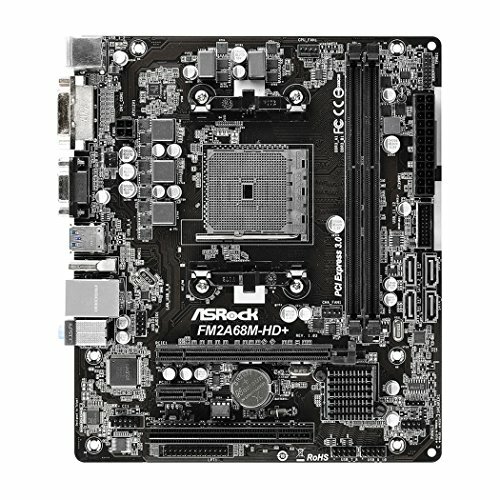 In general, users state that the ASRock motherboard FM2A68M-HD+ meets their expectations.They agree that it has good BIOS, as well as that it is versatile.In addition, they state that both HDMI and DVI ports can be used for a dual monitor. Users conclude that it is great for a beginner motherboard. However, several purchasers complain of receiving a faulty item. One even shares that his item arrived dead. One online reviewer says that the HD AUDIO header is placed in an awkward place, making it impossible to really tuck the cable away nicely. The ASRock motherboard H81 1150 is a solid option if you‘re looking for an Intel H81 model. Users love the features of this motherboard, but some complain of defective items. This product is a Xeon/Core i7/i5/i3/Pentium/Celeron (LGA1150) motherboard. It might be a solid choice if you want a 2.0 Core DDR3 motherboard. The general user consensus concerning the ASRock motherboard H81 1150 Intel H81is that it operates very well. Buyers conclude that it is a must-have for any mining enthusiast. However, some buyers share that their items came damaged (for example, one slot doesn’t work). If you’re looking for a top-rated ASRock motherboard, you might want to consider the B250M-HDV LGA1151 DDR4 model. Users like that it has premium features for the price, but there are complaints regarding the bright red light that cannot be turned off. This motherboard supports 6th generation Intel Core processors (socket 1151) and Dual Channel DDR4 2133. The manufacturer boasts that it features a new high-density glass fabric PCB design that reduces the gaps between the PCB layers to protect it against electrical shorts caused by humidity. The B250M-HDV motherboard has 6 USB 3.0 ports (2 front, 4 rear). There are 6 more models available: H270M-ITX/ac, Z270 Extreme4, Z270 Gaming ITX/ac, Z270 PRO4, Z270 Taichi and Z270M-ITX/ac. This item might be a good option for those who want a motherboard with 1 PCIe 3.0 x16 and 2 PCIe 3.0 x1. In general, users have a good opinion of the ASRock motherboardB250M-HDV and they conclude that it is an excellent overclocker. Buyers appreciate that it has multiple pwm connections, lots of data connectors, great oc capabilities and mosfet cooling. However, some users complain about the bright red LED next to bios A that stays lit by default. Several purchasers complain that the item was dead on arrival. The ASRock motherboard DDR3 2400 A88M-G/3.1 is a solid option for someone who wants a Micro ATX Quad Cross FireX motherboard. Users love the overclocking features of this motherboard, but some do complain about the lack of voltage controlled fan speed. This product is a motherboard with AMD A88X chipset. The memory characteristics: 4x DDR3-2400+(OC) DIMM slots, Dual Channel, non-ECC, un-buffered, max capacity of 64GB. It features 1x PCI-Express 3.0 x16 slot, 1x PCI-Express 2.0 x16 slot (runs at x4), 1x PCI-Express 2.0 x1 slot and 1x PCI slot. This item seems like a solid choice for those who are looking for a Socket FM2+ motherboard. 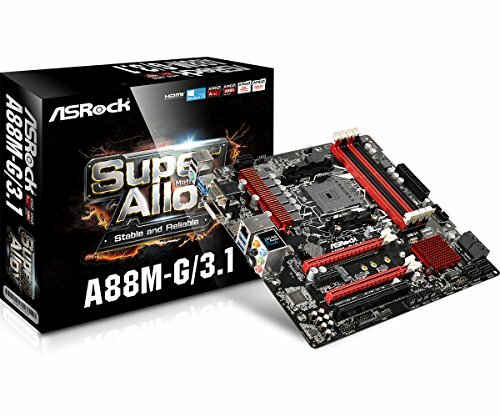 In general, buyers have a very favorable opinion of the ASRock motherboard A88M-G/3.1. They agree that it works great for overclocking. Users appreciate its great BIOS. However, buyers warn that it doesn’t allow for voltage controlled fan speed. As they explain, if you have 3 pin fans they will always run at 100%. Therefore, you must use PWM 4 pin fans to control speed with this board. One disappointed online reviewer states that it worked fine at first, but then it started to make the computer freeze up randomly. Another one shares that it won’t overclock or even operate at normal speed. ASRock Inc. is a Taiwan-based manufacturer of motherboards, home theater PCs (HTPC) and industrial PCs. It was founded in 2002, currently is owned by Pegatron and is led by Ted Hsu. ASRock Inc. is an electronics manufacturer that is concentrated on the development of industrial PCs, motherboards, and HTPCs. In 2002 the company was spun off from Asus for competing with such companies as Foxconn for the OEM market. Starting from that time, this electonics-tech organization has gained momentum in the sector of DIY and in 2007, soon after successful initial public offering on the Stock Exchange in Taiwan, the company started to move upstream. In 2010 the company became part of Pegatron. Currently the company produces HTPC motherboards and consumer, server workstation. The technology company has distributors in more than 90 countries worldwide and branches in US, Europe and China. In April 2013 the company introduced itself as a server motherboard associate. By that time it had already received orders from around 10 medium-size customers for industrial PC and server motherboards and had formed partnerships with several system integrators. It's the third largest motherboard manufacturer in the world. In 2011 it cooperated with J. "Fatal1ty" Wendel (champion, 12 times FPS championship record holder in World Games) in developing an enthusiast motherboard oriented on gaming. Moreover, the following year ASRock enlisted the help of Nick Shih, HWBOT world overclocking champion. Apart from motherboards, they also offer desktop minicomputers. In 2012 three products by the company were shortlisted for Taiwan Brand Award and later became authorized products of the External Trade Development Council. They were promoting Taiwan brands quality image globally. Later the same year, ASRock entered the market of server motherboard and industrial PC. It's the top 3 motherboard brand in the world and its distribution channels cover PC stores, electronics stores, gadget retailers as well as online shops. In 2011 major sales regions included Europe accounted for 37.68%, Asia Pacific region for 40.95%, Central and South for 21.13%, and other markets for only 0.24%. In terms of performance, ASRock accounted for a great proportion of sales in Europe and Asia. Korea: Due to the Korean motherboard market share analysis (June 2012), ASRock is the number one brand with 61% market share. Japan: ASRock ranked number two in Japan. Every single thing which makes a computer work, starting from its CPU up to its RAM and its hard disk, is plugged into the motherboard. It is the motherboard that turns a pile of different components into a computer. Laptop motherboards, unlike those of desktop PC, are custom made and generally designed specifically for laptops. Desktop PC motherboards have specific design standards. This means that you can easily tell where to plug in, for example, a CPU, your hard disk or the RAM. However, that does not actually mean that any component can work with any motherboard. Most graphics cards and hard disks do work with most of motherboard models, but that cannot be said about CPUs. They need to physically fit in the CPU socket of the motherboard and at the same time be compatible with the ‘chipset’. When replacing a motherboard, you need to make sure that it will actually work with your CPU. A motherboard is useless by itself, but it is necessary for a computer to operate. The primary job of a motherboard is holding the microprocessor chip of the computer and letting everything else connect to it. Everything that is necessary for a computer to work, or enhances the way it performs, is either an element of the motherboard or is plugged into it through a port or slot. A motherboard’s layout and shape is called the form factor. It is the form factor that affects how separate components act and what shape the computer's case has. There are a few particular form factors used by most PC motherboards so that they can all correspond to standard cases.